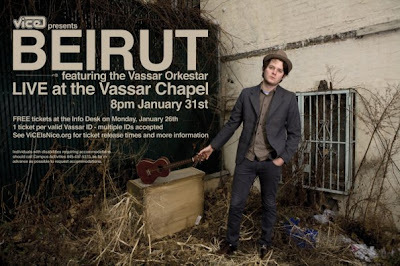 Mads Vassar Blog: Get Your Beirut Tickets Today! Tickets for ViCE's Beirut show go on sale TODAY. Stop by the infodesk at 10am or 3pm for your free ticket. You must present your Vassar ID and can only get one ticket per ID. You may present someone else's ID to get them a ticket. A limited number of tickets will be available at both times. Tickets will also go on sale at 3pm on ticketweb.com for the general public. The concert is this Saturday in the Chapel and 8pm. When I arrived to the college center at 8:45 there were fewer than 50 people ahead of me. By the time the office started distributing tickets at 10, there were around 200 people in front of me. When I finally got my tickets at 11:10, I was number 283 in line. I was very upset to see how rude, disrespectful, and selfish some Vassar students can be. Maybe the VICE system for giving out tickets (allowing multiple IDs) was flawed but I find the real disappointment in this morning's events to be the rude, elitist, spoiled children who cut in front of me and everyone behind me. In a community that so values respect, courtesy, and kindness, I was really hurt to see fellow students treat their peers in such an immature, self-serving way. There definitely should have been a limit on HOW MANY vcards you could bring. Seriously, 10 or 20 vcards for one person? Ridiculous. We limited it to 6 after we realized that people weren't playing fair. Respire, glad to hear that. It didn't end up helping my friends, but it's good to know ViCE stepped up.